Cancer can be difficult to read on lots of levels, including a romantic one. This deeply emotional sign needs to feel safe and secure before he can let his heart be known to the one he admires. And it doesn’t help that the sign of the Crab is famously moody! So figuring out whether he’s into you is about interpreting his actions accurately — namely, his urge to protect what he cares about most. Cancer men show their interest by taking care of the object of their desires, which can manifest in many different ways. Behaviors that might seem a bit patronizing or even overbearing — insisting on walking you to your car, for example, or admonishing you not to lift that heavy box — are actually his attempt to keep you safe. When he makes it clear that he wants to make sure you’re well protected, that’s when you know you truly matter to your Cancer guy. As a Cancer, your flirting style is predominantly traditional, charismatic, and entertaining. A Cancer’s flirting style is very flattering and direct. Many of these folks come across as being shy. However, the truth is that Cancer people want to make sure a prospect is interested before making a move. When Cancer’s flirt, they usually smile at their prospect. They would prefer to make a semi-emotional connection, which is started by a casual conversation. Cancer people are always on guard for impending threats, but they can be entertaining in the process. Most of these folks will tell a few jokes to break the ice. Cancer people will ask many questions, but this quality might annoy a Gemini, Sagittarius, and Aquarius. Their magnetic eyes help them connect with a prospect. Cancer’s generally save their romantic side for lifelong partners. If you are a Cancer person searching for a compatible casual encounter, find a Leo, Pisces, or Capricorn. Compatible long-term relationship zodiac signs for Cancers include Taurus, Virgo, or a Pisces. Flirting with a Cancer can be a little difficult as he is more likely sitting at home or hanging out with family or friends. The Crab loves the security of his shell and is often too shy to join the fun. To flirt with his guy, you need to coax him out in the open. You must be willing to join a Cancer’s inner circle. Once you are part of the tribe, your goal is to become a trusted friend. Flirting will come easily and naturally when his guard is down and he can relax. It’s not that these guys are wimps, not in the least. In fact, they have a mean set of pinchers and aren’t afraid to use them. But with Cancer, it’s all about feelings, emotions and comfort. Crowds overwhelm sweet Crabs so steal him away to a quiet corner and watch him loosen up. Keep the conversation light and friendly and focus on feelings rather than events or material concerns. Be careful not to invade a Cancer’s space or they will retreat. Watch his body language. Cancers are quite passionate when they feel safe so take your time. Let him make the first move. Win him over with conversations about home, cooking, art and dreams. 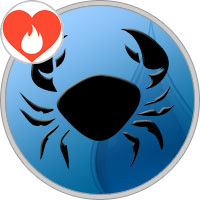 Cancers are great listeners but you will know your verbal flirtation is working when he starts to open up and share his secret world. Cancer rules the chest, stomach, digestive system and pancreas. They love their comfort food and sweets. Win him over with a great home cooked meal and dessert and he will never leave you.